At Apache, we may not stock anything suitable for a Halloween costume — we’re all about stylish all-year-round clobber — but we enjoy getting in the spirit of things. That’s why we’re giving our loyal customers a special 10% discount on all our AW17 season clothing to celebrate Halloween! Take a look at our pick-n-mix of cool new AW17 season gear from world famous brands Fred Perry, Diesel, Replay, and Guide London. Use the offer code HALLOW17 at the checkout to get a 10% discount on all items at Apache! Replay’s groundbreaking Hyperflex jean has taken the denim world by storm since its introduction a few years ago. Using an innovative stretch fabric — a mix of lycra, cotton and polyester — Hyperflex jeans allow you to feel comfortable in virtually any position, without ever losing its shape. Don’t just think of it as a stylish, authentic denim jean, but as a long-term investment for your wardrobe. For Halloween, we’re giving you money off all Autumn Winter 2017 jeans in the Hyperflex range, from this featured grey wash to a gorgeous vintage blue jean. Feel free to explore our complete collection here. 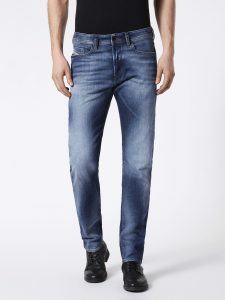 Another great Italian denim brand, Diesel, has adorned our shelves at Apache for as long as anyone can remember! The Buster fit is a perennial favourite of our customers, and for good reason. The classic slim tapered design is made for more “athletic” body types, with a touch of extra comfort on the thigh and tapering to the ankle. Perfect with a pair of trainers for an unbeatable casual look. We’ve pictured the best of the new AW17 season Diesel additions — a stunning Mid Blue wash. Sizes range from 30 up to 38, so we’re pretty sure you’ll find your perfect fit. Last week we unveiled five magnificent new shirts by Jiggler Lord Berlue. 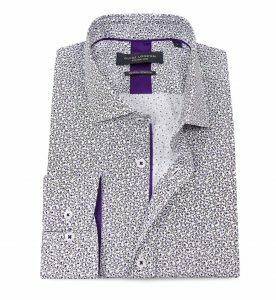 Another great brand for shirts is Guide London, whose white floral print garment is brand new for AW17. Part of Guide’s famous Premium Collection, this shirt is made from a soft, silky cotton fabric that is a joy to wear. With end-of-year events coming thick and fast, you’ll do well to find a better smart casual shirt that makes a statement. 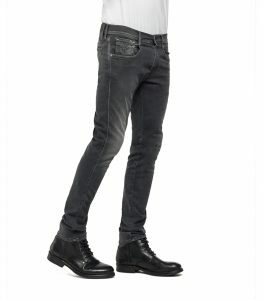 Match with either of the above jeans for an unbeatable look in a bar or restaurant. 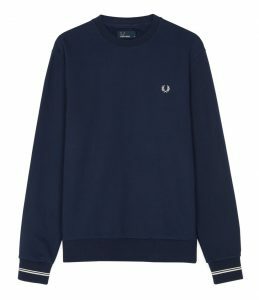 A new arrival from Fred Perry’s “Sports Authentic” range, this track-inspired sweatshirt is one of our best selling items of AW17 season. The loopback cotton fabric is designed to be “cleaner” than most sweatshirts, preventing any pesky pilling on your T-shirt. The twin tipping on the cuffs screams heritage Fred Perry. Available in Navy (pictured) and Iris Leaf. 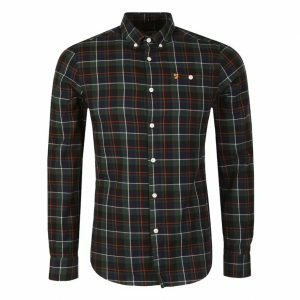 Farah have put out some great check shirts this year, each with their trademark “keep it simple” vintage style. Our personal favourite is this one, made from a lovely soft cotton that can be worn comfortably all day. Available in Topiary (pictured) and Farah Red, this check shirt goes perfectly with a pair of blue jeans or some smart chinos. Here’s that offer code again — HALLOW17. Happy saving!